I love movie. I love history. I love cryptography. I love to hear inspiring story about real people in this world. And I love Benedict Cumberbatch. Owing to those facts about me, it's not surprising that I really enjoy this movie. There's so many people recommended this and it really met my high expectation. 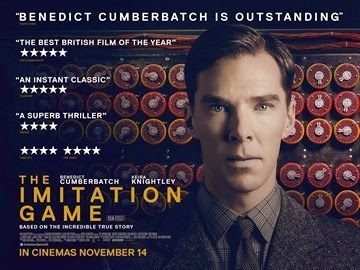 The Imitation Game is a movie about Alan Turing, a genius mathematician, pioneering computer scientist, logician, cryptanalyst, philosopher, mathematical biologist, marathon and ultra distance runner, that help to solve the Enigma Code during World War II. He was highly influential in the development of computer science, providing a formalization of the concepts of "algorithm" and "computation" with the Turing machine, which can be considered a model of a general purpose computer. Alan Turing is widely considered to be the father of theoretical computer science and artificial intelligence. People said that his involvement in solving Enigma Code shorten the war for about 2 - 3 years. That's why I really curious about him and his story. Overall, this movie is great. For a historical movie, it's not boring at all. The production design is really nice. The acting are superb. I also love the music score of this movie. The only thing that make me a little bit disappointed is the accuracy of history that was depicted here. They include many things that didn't happened in real life to add more tension and drama in this movie. But still, it was one of the best movie that I ever watch and left good impression. I recommend all of you to watch this movie. What do you think about The Imitation Game? Comment below and let me know ^^.